We offer Stall Board, Private and General Turn-out in spacious pastures. Our hay is grown here and included in all boarding prices. Keep your horses conditioned year round in our newly constructed 80' x 160' indoor riding arena which is accompanied by an 100'x 200' lit outdoor ring. Both are available to our boarders, instructors and 4-H groups. Trail riding is available and you can make it as effortless or challenging as you please. Now available: lit indoor arena! Lessons available also. Contact us for rates and schedule. We are easily accessible from both the NJ Turnpike and Garden State Parkway. 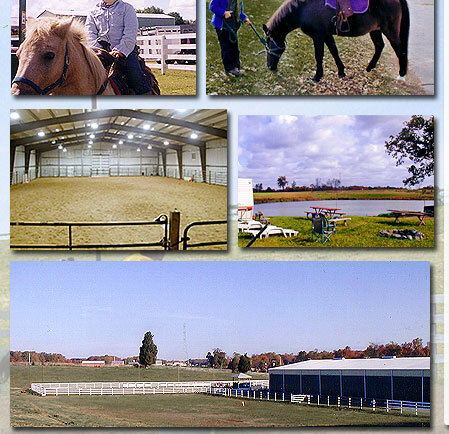 We're also a short distance to such nearby venues as Assunpink State Park and the Horse Park of NJ. Includes stall, hay, bedding, use of all facilities, blanketing. Includes hay, walk under shelter, use of all facilities. All ages, all levels, all disciplines. Please call the below numbers for schedule and rates.